As soon as I feel that fall chill in the air, I get a major urge to bake bread. All kinds of bread. Rolls, loaves, baguettes, etc. 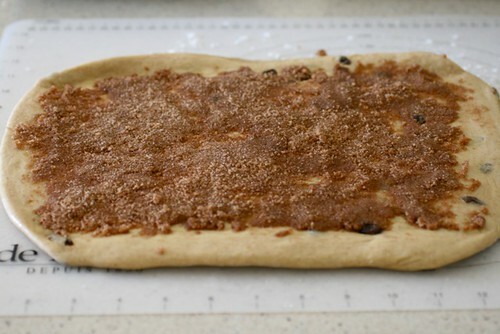 I love the smell of the yeast as the dough rises, the wonderful aromas that fill the house as the bread bakes and of course, getting to enjoy the finished product warm from the oven. 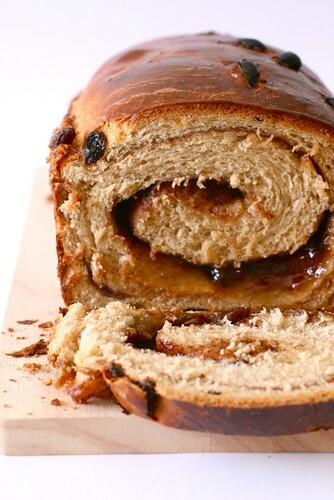 At least for me, cinnamon raisin swirl bread is one of those foods that immediately brings me back to my childhood. Despite the fact that it always came from a store bought loaf, a piece of cinnamon raisin toast spread with a thin layer of butter was a special breakfast treat. I’ve made a few different versions of this recipe in the past, but this one finally has everything I’ve been hoping for. 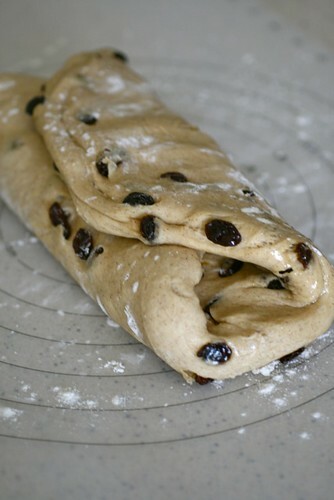 A tender, lightly spiced dough with a sprinkling of plump raisins, and a cinnamon sugar filling that oozes out of the swirls while the bread is still warm. 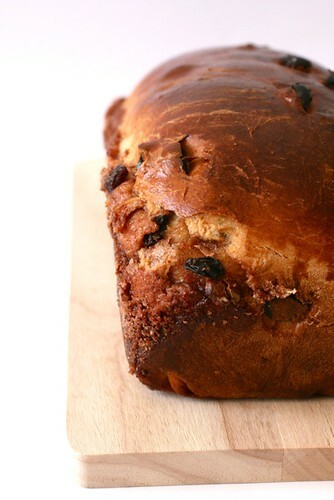 I only made one loaf, but this recipe can be easily doubled to make an extra loaf for freezing or gifting to a friend. If you still feel intimidated by working with yeast, this is another recipe that would be good for a beginner. Remember, there is nothing to be scared of, it just like following any other recipe. Hopefully the step-by-step photos will also help you feel more confident. Let’s get cozy and bake some bread! In the bowl of a stand mixer*, combine the yeast, warm milk, flour, butter, sugar, egg, salt and cinnamon. 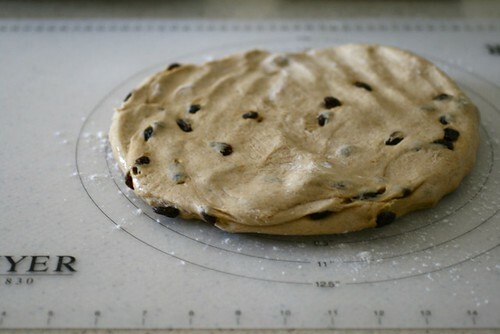 Mix briefly until a dough forms. Switch to the dough hook and knead on low speed until the dough is mostly smooth and clears the sides of the bowl, about 3 minutes. 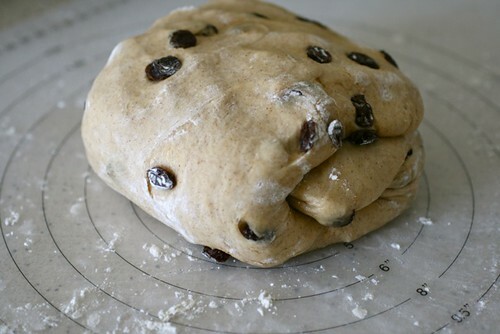 Add in the raisins and allow to continue kneading about 3 minutes more, until the dough is smooth and supple and the raisins are evenly incorporated. 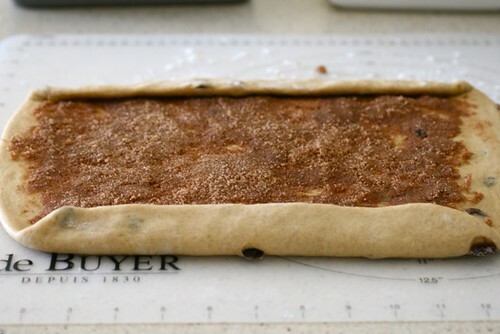 Then fold the right and left sides into the center in thirds, forming a rectangle. Press down to seal. Return to the bowl, cover and let rise again until doubled, about 40 minutes. Generously butter a 9 by 5-inch loaf pan. 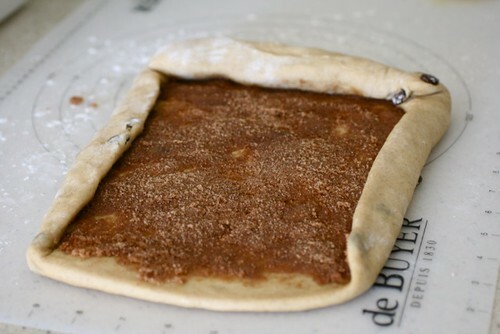 To make the filling, combine the sugar, cinnamon and water in a small bowl and whisk until well combined. 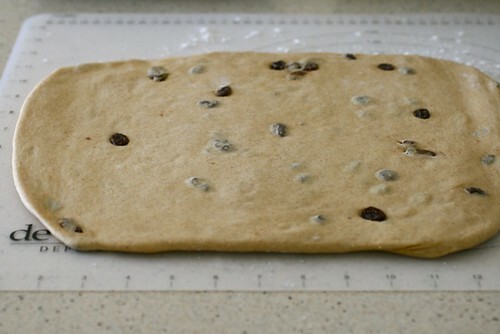 Return the dough to a lightly floured work surface. 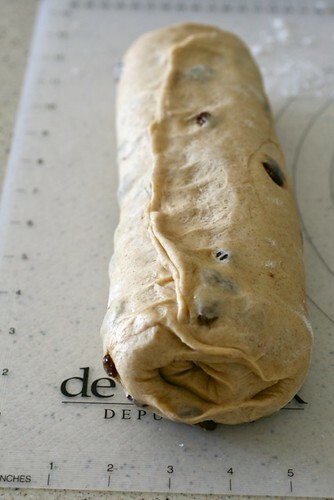 Cover loosely with plastic wrap or a clean towel and let rise until the dough rises just above the edge of the pan, about 30 minutes. Meanwhile, preheat the oven to 425˚ F. When the loaf has risen, brush the top of the loaf lightly with the remaining beaten egg. Bake, rotating the pan halfway through, until the loaf is golden brown, about 45 minutes. If the surface seems to be browning too quickly, tent loosely with foil (I did this halfway through baking). Cool in the pan 5 minutes, then turn the loaf out and transfer to a wire rack to cool completely before slicing. 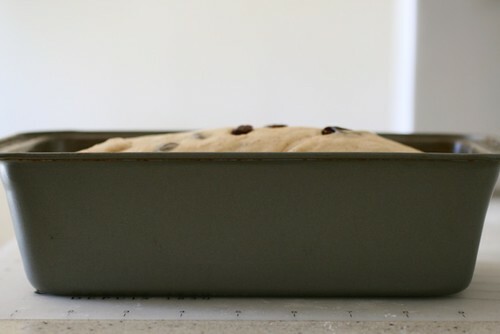 *This dough can be made by hand and a stand mixer is not required. Mix the dough ingredients in a large mixing bowl and once the dough comes together, knead on a lightly floured surface until the desired texture is achieved.